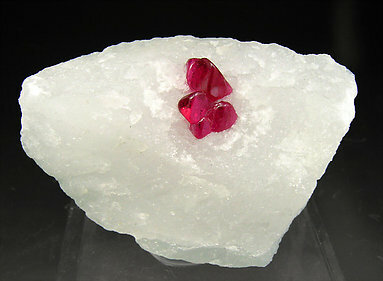 Very sharp octahedral Spinel crystals, translucent, very bright with a very uniform magenta-red color and on matrix. Of the best quality for the locality. 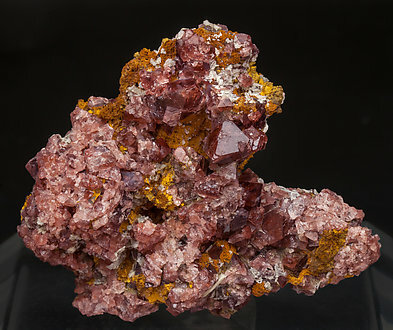 Floater aggregate of octahedral Spinel crystals that have parallel growths, are translucent, very bright and have a very intense and deep color. 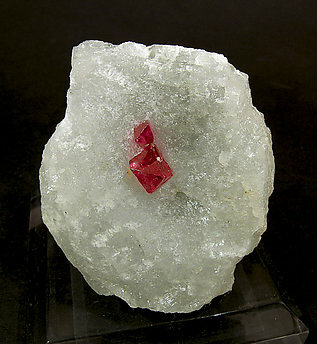 Aggregate of octahedral crystals with red tile color. They are bright, tabular, with a considerable size for the locality and showing clearly the typical twin of the species. 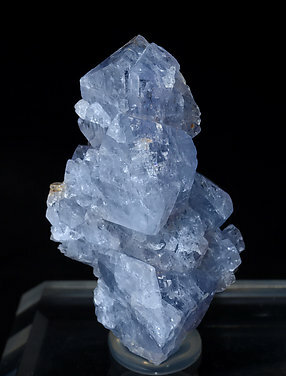 Parallel growths of octahedral crystals with very well defined faces and edges, between transparent and translucent, very bright and with a luminous sky blue color. This shade is one of the less common for the species. 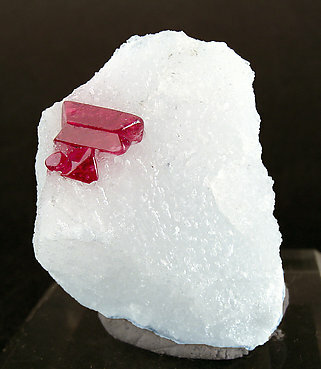 This Spinel is not only gemmy, but also extremely clear, standing upright on top of the Calcite. The crystal is complete, although as the photo shows, one corner is less sharp (more rounded) than the rest of the crystal faces. The light passes through this crystal so easily that it almost seems to be attracted by it! 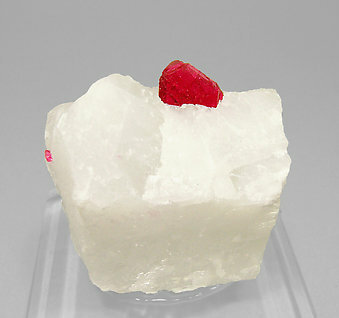 Three octahedral crystals, which are a perfect red and which stand out from the white Calcite matrix. 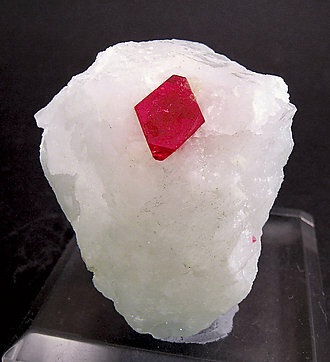 The Spinel crystal has a very flat look as one of the faces of the octahedron has grown far more than the others. 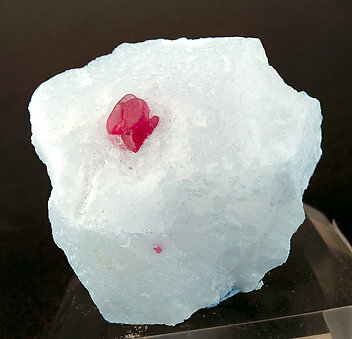 This form, as well as the contrast of the red crystal with the white matrix, is probably the most notable thing about it. 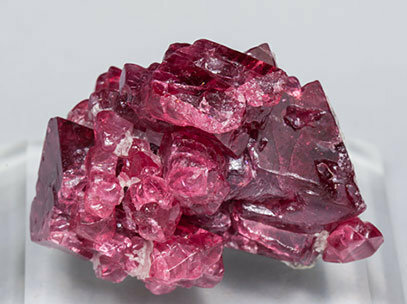 To this one can add the small flat Clinohumite on one of the upper faces of the Spinel crystal. In UV light the Spinel stands out even more as it is intensely fluorescent yellow. 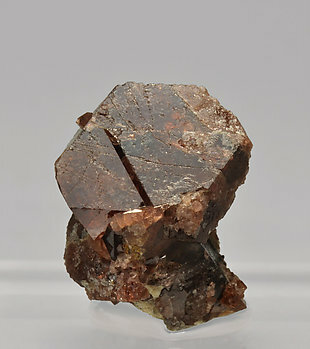 A single octahedral crystal that has some extraordinarily elongated faces that confer to it its prismatic shape. 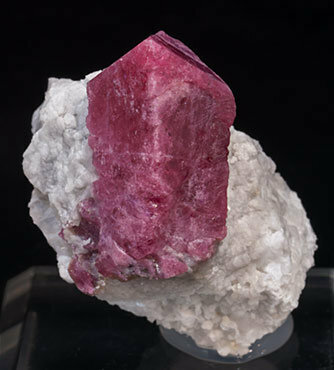 The crystal, on a Calcite matrix, is translucent, bright and has a deep red color, especially vivid when it is under an intense light. An excellent sample, very esthetic. 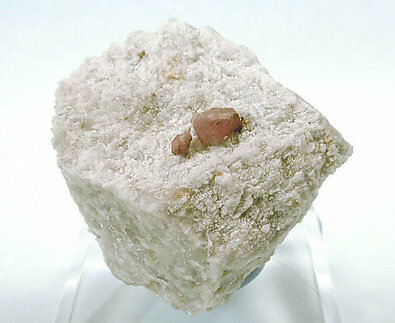 Very sharp octahedral crystal, on white Calcite matrix, with a flattened growth that produced a large octahedral face, far more developed than the other faces. 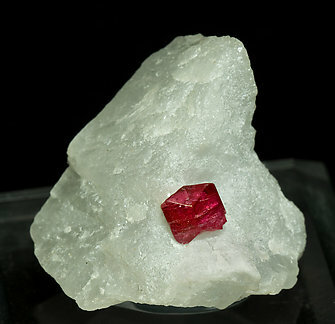 In addition to its notable luster and degree of transparency, we especially note the color, very vivid and deep. 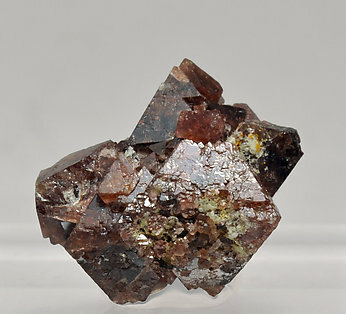 An octahedral crystal, of good size, that is notable for its unusual color. 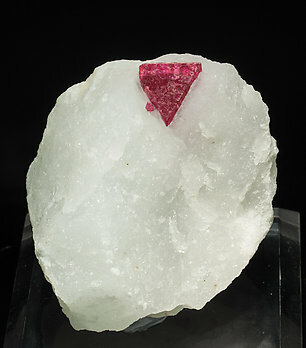 At the same time the amount of the crystal that stands out from the marble matrix is significant and the crystal form is sharp with perfect faces and tips. Its brilliance adds that final touch. The small internal fracture near the tip, which you can only see given its transparency, does not detract from its high quality. 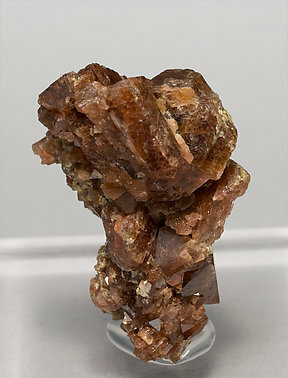 Group of crystals of excellent color, luster and transparency, on Calcite matrix. 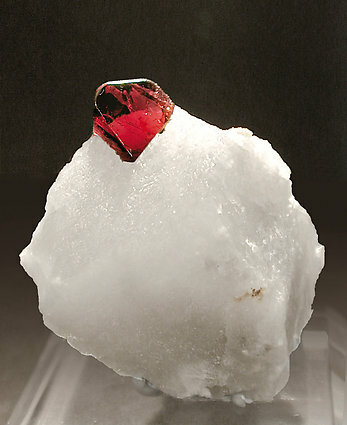 The main crystal clearly shows, on its upper part, the twin that is named for the species. 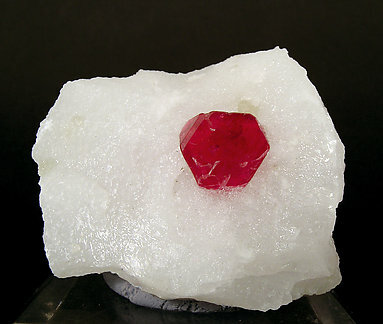 A good size crystal of Spinel, really red, absolutely perfect, and set well apart from the matrix of white Calcite. Everything is good = a great specimen. 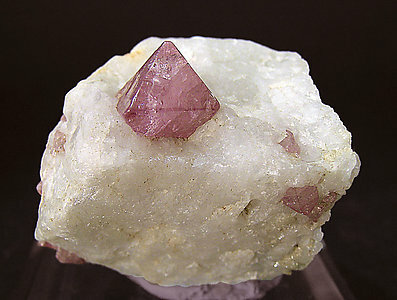 Octahedral Spinel crystals with very well defined faces and edges that are transparent and bright and with a uniform mauve color. 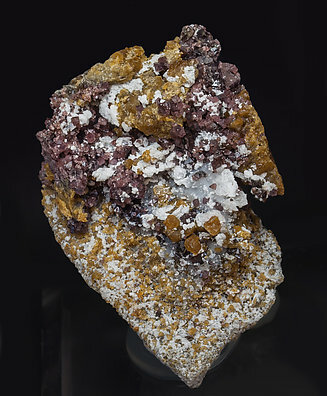 They are on matrix with translucent and bright honey-colored Clinohumite crystals and white Calcite growths. 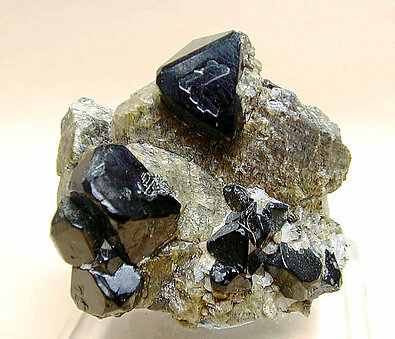 From an old Canadian locality, sharp and pretty brilliant black Spinels well placed on Forsterite matrix. Good esthetics.